In June 1900, representatives of the Oregon Historical Society traveled to Seaside, Oregon to try to identify the original site of the Lewis and Clark salt cairn. Accompanying them was an 86 year old Clatsop Indian woman named Jennie Michele. Her Clatsop name was Tsinistum. She told the men her mother had visited the site in 1805 and had met the expedition members. Her mother showed her the site where they made salt, and she visited the area many times. Her testimony was corroborated by Judge Thomas A McBride in December of 1900. He was shown the site by Celiast, the daughter of Clatsop Chief Coboway. The visitor center includes a replica of Fort Clatsop similar to the one built by the explorers, an interpretive center offering an exhibit hall, gift shop and two films. The center features ranger-led programs as well as restrooms and a picnic area. The park is open every day of the year except December 25th. Fort Clatsop Visitor Center Open All Year Mid-June - Labor Day 9:00am - 6:00pm After Labor Day - Mid-June 9:00am - 5:00pm Location 92343 Fort Clatsop Road, Astoria, Oregon 97103 Fort Clatsop Exhibit Open All Year After Labor Day - Mid-June 9:00 am -5:00 pm Mid-June through Labor Day 9:00 am - 6:00 pm Netul Landing Open All Year Labor Day through mid-June 9:00 am - 5:00 pm Mid-June through Labor Day 9:00 am - 6:00 pm Location 1.25 miles South of the Visitor Center. Lighthouses stand sentinel atop windswept cliffs, sea smells waft up through the air and waves collide with a crash where the Pacific Ocean meets the Columbia River below. 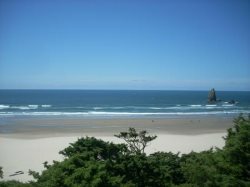 Named for Captain John Meares� first thwarted voyage to find the Columbia, Cape Disappointment is steeped in Northwest history. This is the place to explore U.S. military and maritime legacies and to experience the story of Lewis & Clark and the effect of their Corps of Discovery Expedition on Native American tribes. Step into the Lewis & Clark Interpretive Center for interactive exhibits. Find overgrown ruins of military bunkers and coast defense batteries, and hear tales of two lighthouses and the first attempts to reach the Columbia River by ocean.